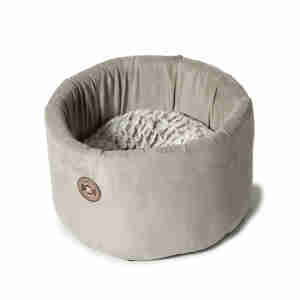 Give your cat the perfect place to take frequent catnaps with the Danish Design Arctic Cat Cosy Bed. Made with faux suede and featuring high sides, your cat can dive straight in and laze on top of a faux fur cushion. Luxury in appearance and comfort, the bed is machine washable and the cushion can be removed to suit those felines that want to have a little more privacy whilst snoozing. Measurement refers to the width of the bed. I am feeding a stray who prefers the outdoors and was worried about the cold weather. So I bought this cosy cat bed and put it in the greenhouse. He absolutely loves it. It has high sides so keeps out any drafts. Also has a deep cushion which is so soft for him to lie on. Easy to wash too. A lovely warm bed for cats.